I really miss eating deli meat sandwiches when I am pregnant and am always looking for other quick, healthy and satisfying lunch options. 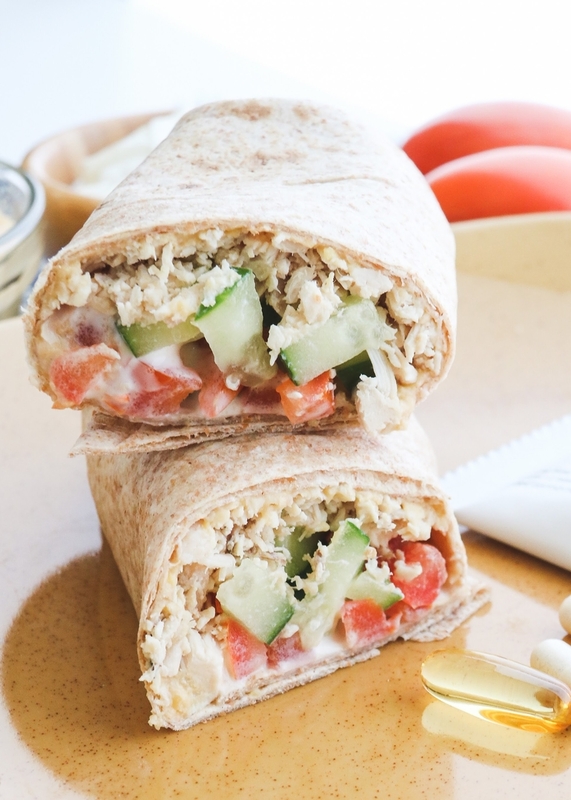 Here is an easy wrap that uses rotisserie chicken instead of deli meat so that it is pregnancy approved. Directions: Spread hummus on tortilla. 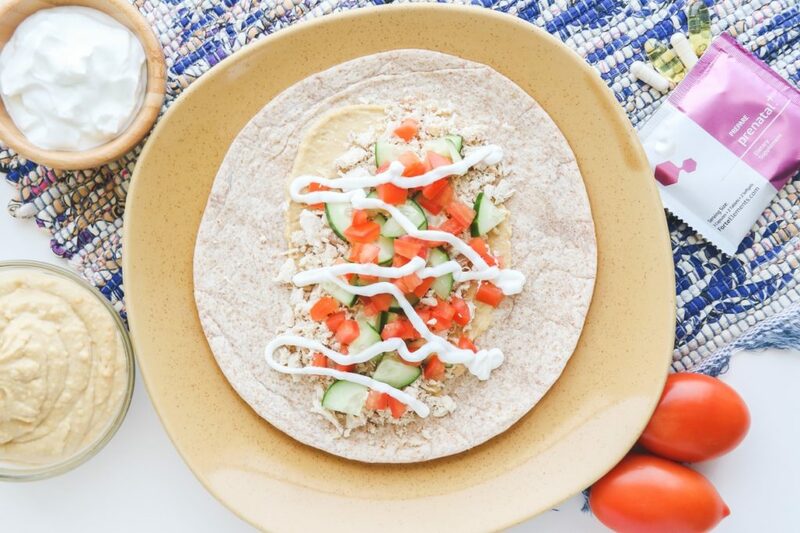 Top with chicken, tomatoes, cucumber, and plain yogurt, and roll up tortilla. I recommend using whole grain products, including tortillas, whenever you have the option. Whole grains have many health benefits over refined grain products. One is fiber. Whole grains on average have 5gm of fiber per serving, while refined products typically have 1gm. Another big benefit is that whole grains also have significantly more micronutrients, including vitamins, minerals, and other phytonutrients that are important for optimal health. Most people typically use hummus as a veggie or pita chip dip, but it also makes a great spread for a sandwich or wrap. It not only adds a great flavor, but it has a lot of great nutritional benefits as well. The typical hummus recipe contains garbanzo beans, olive oil, and garlic as well as other ingredients. All of these are nutritional powerhouses with many health benefits. Garbanzo beans are rich in complex carbs, protein, fiber, iron, zinc, and folate. Olive oil is a great source of monounsaturated fatty acids, which are important for heart health and diabetes prevention. Garlic has several properties to help boost the immune system and to fight inflammation. Hummus is also very easy to make at home and can be easily adjusted to meet your needs. I also finish this wrap off with a dollop of plain Greek yogurt. It adds all of the creaminess of sour cream but is a much healthier option.